So I celebrated my one year blog anniversary last week with a wonderfully long snooze and a big glass of a non-alcoholic beverage. Feeling nostalgic, I decided to read my old blog posts from last year. It was a decision I regretted almost immediately. My lips pursed with contempt as I continued reading my cringe-worthy content. After a night of oh-so-sad lament, I thought of what I should have done instead. What I would say to Past-Me who has never blogged before on how to improve her blog. Short Answer: Many, many, many things. But these are my top five. Here are some things I wish I knew when I began blogging. Always Ask Away | Blogging is thought to be a one-person activity and it is...most of the time. We'll need help that Google can’t provide. Yes, Google is your friend. She helps a lot with coding, advice and always there for the random late-night philosophical question. But, it can't help you with everything. Though I’m sure our Google-y Overlords will fix that soon. Looking through old posts, I found problems that could have been solved I asked for help. Now, my sister clicks the button behind the camera, my friend taught me basic Photoshop, and an editing app for my writing. Sometimes you need that hands-on approach and asking is the best way to get that. Find Your Format | This is different from your niche. I’m still finding a niche, and I don’t want to limit myself yet. Niche is what your blog is about, Format is how you structure your blog. The design and layout and post should be consistent though always suspected to change. One quick look at my blog, and I know its structure. A simple black and white design with a nice, non-crowded sidebar. A regular post has photos first, an introduction then Read More… for more content. This is how I like to posts, works for me but might not for you. Heck, I might not like it in six months and change it. Comment Commentary | If you have to remember something from this blog is to comment. Comment on comment on comment. It's the best way to gain traffic, and to gain blogger friends who share the same interests as you. And yet, it's woefully looked over upon. People took the time to comment on your blog. So you should do the same. I visit every blog and leave a genuine comment. It brings me joy to see comment notifications when I check my emails in the morning and I hope my comment might do the same for another. Most of the time, comments let me discover an exciting blog, that I add to my list of blogs-I'm-in-love-with. Mother Knows Best | Sometimes you’ll regret the things you post. That’s okay. It’s a representation of how you were in the past. But I hate reminding myself of things I regret. So, to sway from this, I do a little exercise. Imagine a figure you respect reading your blog (i.e. Mommy Dearest). Do they like it? Would you they be alright with it? Will they cover their mouth and scream, ‘Oh my word! ?’ And do you want that? If you’re fine with your mom finding your content, then great! If not, perhaps you shouldn’t use the word ‘crap’ seven times in a paragraph. But if you don’t care, then great! This is just helpful for me. Take it or leave it, this is a self-editing tip I got and stuck with. Personality Triumphs | Anyone can give you tips on how to improve your blog. What mistakes to avoid. How to grow traffic. Yet, I think to get the most fun out blogging for both you and your readers is to show your personality. When a blogger is sarcastic, or excited, or even a little sad, it shows you’re genuine in your post, putting in hard work and effort. When you go through the endless blogs of fashion, beauty, lifestyle, those that stand out are the ones that make you feel. Happiness, amusement, nostalgia. My favourite bloggers are those who bring their personality into their posts. Write what you feel, not what you feel people want to read. So be yourself. Your silly, talkative, a little dorky self. In all, I hope you can apply this to yourself one way or another. This has helped me, and I wished I knew this when I started. Though in the grand scheme of things, I'm still very much a beginner. Starting a blog is a big step, even if it's just a click of a button. So congrats to the beginners, the long-runners, and the in-betweeners! So what blogging tips do you have? Or wished you knew when starting out? I 'd love to know! Very helpful tips, and I agree with having a structure -- that's really important! I totally agree with you when it comes to comments, it's such a fantastic way to get and stay in touch with other bloggers! I also often ask myself, so wud I be fine with my mum etc reading what I just wrote, it helps post things you won't regret at some point! Agree so much with these tips, especially the comments one, it's a great way to recieve or give feedback and well as interact with other bloggers! All great tips! Good of you to share! This is a great post :) I've only been blogging for 3 months and I already look at my past posts and cringe! I think I improved most in the picture taking and editing department. I should have looked for more inspiration there in the first place. Good tips! I noticed commenting on people's blogs is a big help. I've discovered more blogs that way too. And writing what you feel is truly the best. Great tips. Commenting on a person blog and being really honest about it is the best way to go. You will learn and gain some blogger friends in no time. Great tips, I love posts like this as it helps everyone out and remind people to stop and remember the little things that will actually help and maybe make the biggest improvements to their blog. I love the comment on comment on comment part. In this way bloggers around the world are connected. Thanks for your tips! They were helpful. X! Definitely agree with these tips, and hey - the longer you do this, the more you'll learn from mistakes and alway from observing others! Really great post! These are tips that honestly anyone can use in their blogging career. I think being yourself is the most important, because the only blogs I want to read are genuine ones. Commenting is also extremely important, not just to gain readership and new blog friends, but because blogging is a community effort and should be treated as such! Still, I am facing the problem now that with a fulltime job and faily daily blogging schedule, combined with the amount of comments I receive, I don't get to reply to comments or visit the pages of my commenters nearly as much as I would like. Congrats on a year of blogging! I wish I had read this when I fist started blogging! Lovely tips!! 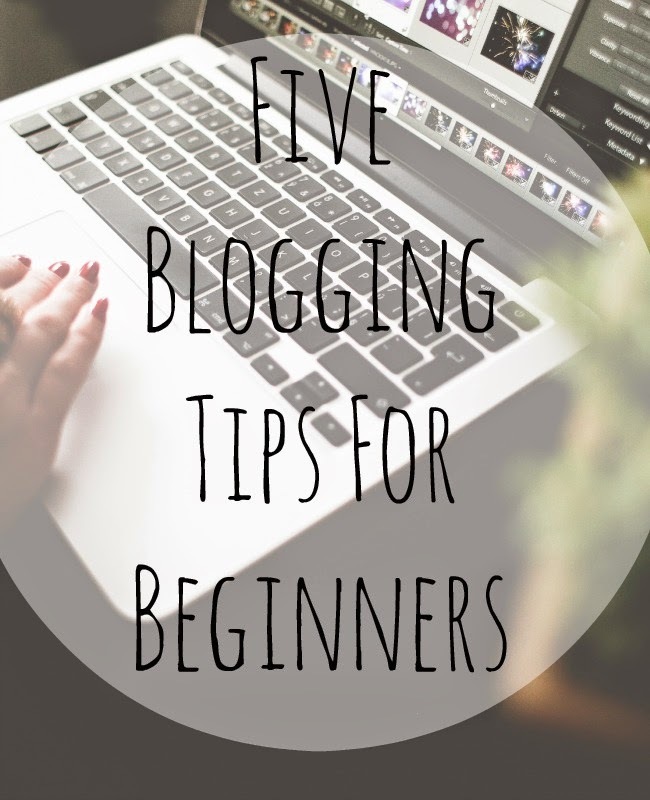 Blogging can be so difficult as a beginner. Asking questions is something I am still learning as I would rather google it then ask for help. I love your layout by the way, it's simple and easy, often times I stumble on blogs with too much going on. As for commenting that is a tricky one, the amount of spam comments with links these days is baffling. Sometimes I don't comment on blogs if I'm sure I'll be ignored. Also replying comments is something I'm trying to get back at, I have been successful so far but in the past I was slacking in this. When I look at old posts my biggest tip is my photography, my camera angles were off but what's the blogging journey if we don't learn something new everyday. Thanks for the tips! I just started a blog with my BF a few months ago and we will definitely take some of your advice! Happy one year to your blog! Here's to many more years of being fabulous! Wonderful & unique tips. I like the last one the most, you really just have to be YOU in your posts. It's so much more fun to read a personal, well written text instead of just yet another review. I think that's what makes people come back to a certain blog as well, if you're different from the rest, just because you're just being yourself! Hi there, great tips, I have been blogging for a year or so and I am always learning new things. thanks for sharing. Hi. I like your post! Have a great day! I´ve just discovered your blog and love it!! thanks for these really useful tips, so interesting post!! I´m just starting my blog and would like you to visit it, and follow each other if you wish! Great tips dear, I totally agree!! Very helpful tips. I am new to blogging and having a blast with it, but I know I will probably cringe a year from now as well. Thanks for sharing your tips, especially for new bloggers. We need all the help we can get. These are all great tips. I agree with comment and being your self. Thanks for stopping by! Congrats on your year! I'm into my third month blogging now and still finding my feet! I'm loving every minute of it though, and love that I now have a writing outlet that I'm passionate about! Thanks for the tips!! This is so well thought out. I like the way you made the distinction between format and niche . Good advice to maintain some personality.. it is what keep me interested, too. Pictures are a good draw, but some pithe and meat, and personality is what hooks me. Great tips, just went through your older posts and girl you've definitely grown. Change is constant and when we can understand that it will all work out. Great tips! I look back at my blog and it's so cringe-y but it's so nice to see how I've developed! Great tips! I think sometimes we're embarrased of asking for help, and it's the best we could do! I sometimes asked big bloggers for help regarding topics that I have no idea about and it's been very helpful, I've learned a lot. Also I learned to try to show who I am in each and every post. Great post! These are incredible tips, thank you :-) I think all too often we can be afraid or embarrassed of asking for help but it definitely pays off! *shifty eyes* I'm Glad i'm not the only one whose blog just turned one and doesn't have 1000 followers. I kind of feel like, what was I even doing during the year? I think I was just writing for me and not even networking or advertising or anything. 2015 baby, this is my year!